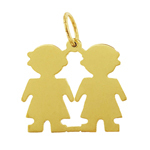 Celebrate the arrival of your precious little ones with an exquisite 14Kt Gold Engraveable Triplet Plate Charm. 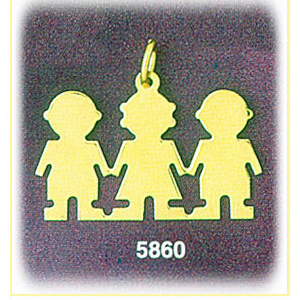 Whether you are expecting triplets or looking for a charm to represent your three children, this 14Kt Gold Engraveable Triplet Plate Charm is an excellent selection. 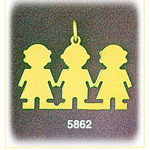 Magnificent 14kt gold is finished with a smooth polish and crafted to reveal the image of three toddlers, two boys with one little girl in the middle. 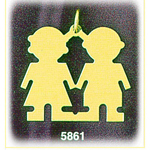 Pendant is crafted in 14k yellow gold featuring a polished finish with flat back, it measures approximately (30mm - 1 1/8") in width by (16mm - 5/8") in height and weighs 2.6 grams, it is recommended for necklaces.